; 10 for $10 Barilla Pasta 12-16 oz. select varieties Pennsylvania Dutch Noodles 12 oz; $0.99 Chicken Of The Sea Solid White Tuna; $4.99 Dunkin’ Donuts Bagged Coffee 11-12 oz., select varieties Folgers Single Serve K-Cups 12 ct., select varieties; 2 for $6 Tropicana Orange Juice; 2 for $5 Eggo Waffles; $3.99 Pumpkin Donuts with Glaze 6 Pack; $5.99 Oxi Clean Power Crystals 20.3-26 oz. Oxi Clean Dishwasher Booster 15.6 oz; $4.99 Sunbutter Sunflower Seed Spread; 25% off Covergirl Cosmetics; $2.49 Crisco Vegetable or Canola Oil 48 oz. Coffeemate 32 oz; $2.99 Kraft Singles; $2.49 Purex Liquid Detergent; 2 for $9 Tidy Cats Scooping Litter; $5.99 New England Coffee Single Serve; 5 for $4 Campbell’s Chicken Noodle or Tomato Soup; $1.49 lb Northwest Bartlett or Bosc Pears; 3 for $12 Jack O Lantern Pumpkins; 2 for $5 Ocean Spray Cranberries; $12.99 Breast Cancer Care Bouquet. 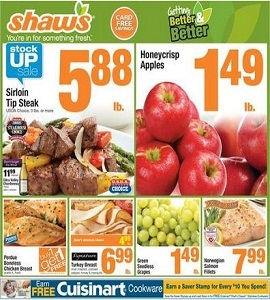 To see the weekly circular for your favorite Shaw’s store, search by ZIP Code or City, State. Target Weekly Ad April 21 – April 27, 2019. Car Seat Trade-In Event! Rite Aid Weekly Circular April 21 – April 27, 2019. Stock Up & Save Big!